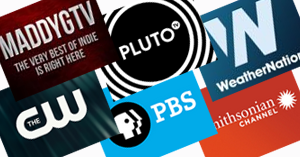 Pluto TV recently signed a deal Gravitas for streaming rights to over 2,000 movies. You'll find a dedicated Gravitis Movies linear channel (channel 721) on the Pluto TV Roku channel that streams documentaries and feature films, including comedies, dramas, and horror films. Keep up with local and national weather conditions and forecasts with WeatherNation, which streams live weather newscasts from certified meteorologists. In addition to the live newscasts, you'll get local weather conditions, radar and forecasts for your location (or any location you choose). BBQ with Franklin - Pitmaster Aaron Franklin takes a boisterous road trip of BBQ culture - the people, the places and of course the food. Ten half-hour episodes celebrate the traditions and storied histories passed down through the generations. The Victory Garden's Edible Feast - A re-launch of the classic PBS series combined wiht the deep local knowledge of Edible Magazines. A Chef's Life - A half-hour character-driven documentary and cooking series that takes viewers inside the life of Chef Vivian Howard, who, with her husband Ben Knight, left the big city to open a fine dining restaurant in North Carolina. The CW is a rare offering by a major network that gives you free access without a cable or satellite TV subscription. You'll find over a dozen current and former popular shows including Riverdale, Supergirl, The Flash, Arrow and DC’s Legends of Tomorrow, along with the award-winning comedies Jane The Virgin and Crazy Ex-Girlfriend. Episodes are available the day after they air, and CW promises to "always have the last 5 aired episodes available so you can catch up." Secrets: Blackbeard's Ship - Blackbeard's ship, Queen Anne's Revenge, sank off the North Carolina coast, bringing an end to her six-month reign of terror in 1718. Now, nautical archaeologists, historians, and scientists are studying the remains of the wreckage. WWII's Most Daring Raids: Easy Company's First Assault - Witness the moments before the D-Day invasion through the perspective of the men carrying out the daring raid, including commanding officer Lieutenant Winters, whose remarkable improvised assault against a much larger force would make history. The Real Story: Apollo 13 - The 1970 rescue of Apollo 13 captivated the nation and the film adaptation won two Oscars. But how close to the truth was the film? To reveal the truth, we put the big movie moments to the test. Beginnings - A plague has decimated society. While many struggle to live in the new harsh world, a group of survivors have established a new civilization called Beginnings. Intervention - The story about the friendship of two women over a span of 20 years. Their loves, hopes, new beginnings and eventual pain that will leave you asking how far would you go for a friend? Venture - Venture has been in the post-human world for 15 years. But what most consider the end of the world, is only the beginning for her. Click here for more of our What's on Roku recommendations. Get notified of new postings by following Twitter hashtag #WhatsOnRoku.